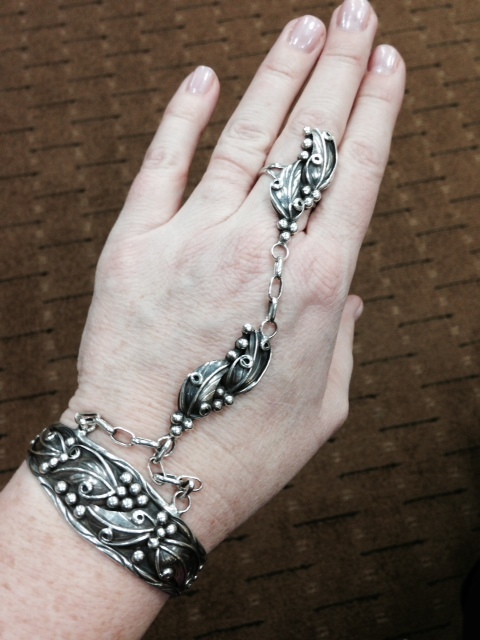 Silver Leaf Slave Bracelet – is it Native American? I just found your blog & think you might be able to help me out. 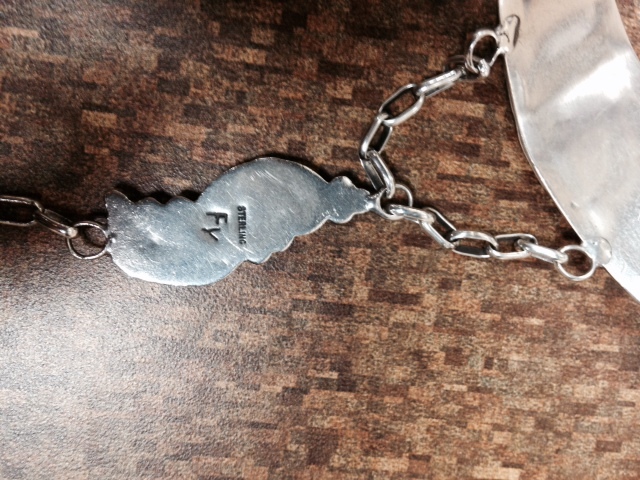 I inherited a lovely sterling slave bracelet with the Hallmark FY. I’m not looking to sell it, just get information on it’s design & possible origin. There are no stones, which I think is unusual. The pattern is silver leaves, stems and small berries. The silver work detailed. I’m wondering if you could help me with information or if you could send me in the right direction. I also know that the “slave bracelet” style is not Native American origin. But I think this piece still may be Native American work. I’d just like to know more about it. It was my Grandmother’s piece & I believe my Great Grandmother may have bought it for her. I have no idea when it may have been purchased as both Grams are gone now. Grandma wore the piece every day for at least 10 years. It jingles prettily when you move your wrist or hand. I think it looks vaguely like Navajo but with a more modern twist. What do you think? Pretty bracelet and good story. I can hear in jingle all the way over here in Colorado ! While not Native American in origin, Navajo silversmiths have made slaves bracelets to satisfy the demand for them, perhaps mostly in the 1970s. The silver balls you refer to as berries are usually called raindrops. 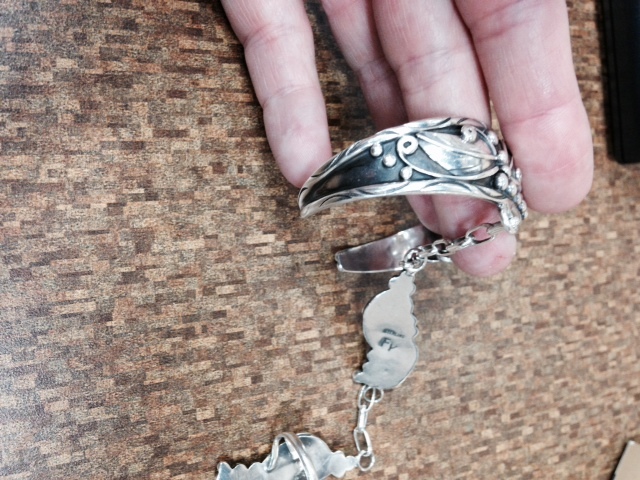 We have had some vintage slave bracelets (same era as yours) come to our store in estate lots. Here are two we have sold in the pawn shop and one vintage New Old Stock slave bracelet that is currently for sale. Also contemporary artists are still making them – here is one from this past year. As far as the FY hallmark, I’d say that would be Frank Yazzie, Navajo. And being that it has the Sterling hallmark on the back, I’d guess it was from the 1970s. Slave bracelets are not typically associated with Native American culture. Although it is said their origin is Africa, they are more commonly associated with the other “Indian” culture, that is, India. They are a common piece of jewelry associated with harems and belly dancing. A slave bracelet has 3 parts all connected together – like yours. The bracelet, the ring, and the connector. Sometimes the connector is a series of chains and sometimes there is an island in the middle of the chains between the bracelet and the ring, like your bracelet and like the one below. With that said, we have had several older Native American made slave bracelets come through our pawn shop as you have discovered. And contemporary Navajo and Zuni artists are currently making slave bracelets. Where there is demand, there will be supply. I’ve seen Native American made slave bracelets of all silver, silver with turquoise, malachite or onyx but I’ve never seen one made with amethyst. So you have a unique item there ! It does look Navajo style. As far as the hallmark SC, I have no information on that but perhaps someone reading the blog might.